I’m not real sure who said that to me yesterday. I think it was K-man's “Grandpa-Roy”. I totally, most heartily concur. Because what else can you say? 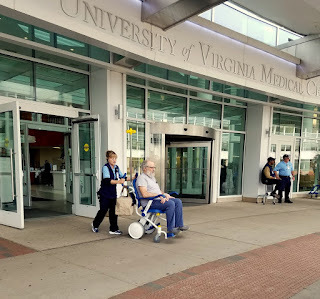 From the time the medical center called early Tuesday morning saying they had a cancellation and if we got there sooner than scheduled, they’d get us right in…the week took off with a mind of its own. Naively, we thought that sooner meant quicker. I mean, a 4-hour surgery…surely the Boss would be in a room by afternoon and I could come home and do chores. Right? Most definitely wrong. It was 9:30pm before he got to a room. Then the round of doctors, nurses and PCAs went all night. It was 6am before I headed back to the hill. 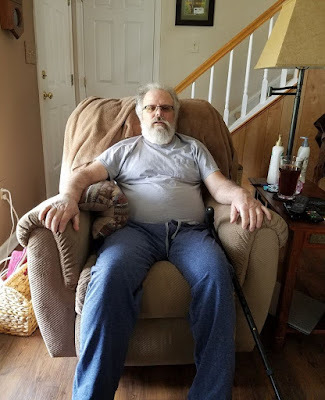 A big THANK YOU to daughter #1 for sitting with me for hours and hours and hours until we could go see him in recovery. Another big THANK YOU to daughter #2 for doing the farm chores for me so the animals didn’t feel neglected. The surgery went well. The doctor (and his team) were pleased. They got the entire tumor and we will find out next week what the pathology report says. As it stands, the Boss does not have to face any further treatment. one heck of an incision! But, as a reminder to him (and an explanation to you) it was indeed MAJOR surgery. They had to cut through the rectus abdominus which is a really big muscle that is involved in a LOT of everyday movement. And, according to the Boss, it “hurts like hell”. He rarely cusses, so that expression alone should give you a clue as to the severity of the pain. They moved all his insides around, so there's still lots of swelling and discomfort as well as the pain from the gigantic incision. but, do YOU think he looks like Moses? He wanted me to go to the party for a while. 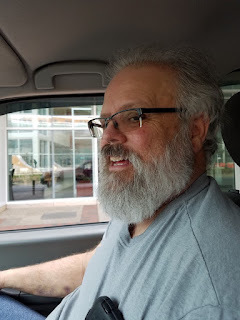 I said HAPPY Birthday to the birthday boy, hugged a few family members, snuggled one of the new babies and then it was time to hit the road again. I was nowhere near the hospital when the Boss called. They were releasing him RIGHT now! Please hurry…well, don’t hurry…but, come on. If anyone doubted that they would release him at 3 o’clock…I took that picture at 3:09pm. He was elated to get in the car and head home. However, the drive over the mountain is far more difficult when you’re in pain than you ever think it should be. But, he’s HOME! There is truly NO place like HOME. He wants me to thank everyone for him…from the bottom of his heart, he says. I’m sure when he’s feeling stronger, he will post something himself. It has most definitely been A WEEK. I had a lot of things I wanted to write about. We missed Ag day. You can read this old post. We missed our farm ownership anniversary. 20 years! You can read this old post. It is very easy when you’re in the midst of your own dramatic life event to become truly insular and not notice anything around you. Although, UVA is teeming with other folks who all have their own struggles. When you stop and consider all the suffering and worry that is going on around you, it’s more than a little humbling to know that so many folks are worried about YOU. 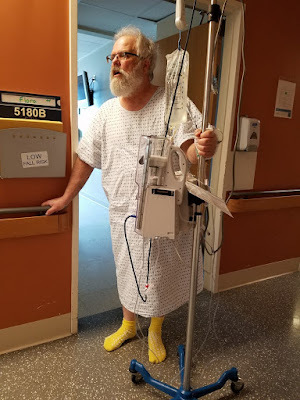 In our short hospital stay, I caught up with 3 acquaintances who are going through their own serious health struggles. One included a trip in the NETs (Newborn Emergency Transport Service) from Harrisonburg for one of our Market vendor’s newborn twin sons. The babies were taken to Neonatal Intensive Care, where one is doing quite well. The littler baby is worrying everyone. And, Mom is staying in C’ville while Dad goes back home. So, you may want to say a prayer or ten for the Shirk family as they struggle to take care of children at home and worry over a critically ill newborn. Somehow, knowing that others are even more needy puts our own situation in perspective for me. We thank God for putting all the right people in the right place at the right time. And, in closing, THANK YOU…many of you have messaged, called and just reached out to us and we truly appreciate it. We have heard from friends from all over the world. And, to my own friends who are concerned specifically with my concerns, I love you ladies! All y'all are awesome! I hope you have a Happy Sunday! Right now, I’m off to town in hopes of getting his pain prescription filled. Wish me luck! Gus watching "Winter Storm Stella"
I know you’ve come here looking to see what happened on the hill this week....wondering how things went. Hmm, well...to put it succinctly...I would probably say the week sucked. However, I truly hate that term. It’s rude, crude and less than articulate. So, I guess I’ll try again. Sorry, I still got nothin’. When the week starts with a trip through the darkness of the early morning to a place you hoped you would never see, to discuss a problem you never expected to face, and you hear words you never wanted to hear, you might figure it could only get better. But, you would be wrong. The award-winning surgeon in the world-class facility discussed things we had never really anticipated. That vague, somewhat undefined complaint had a more sinister connotation. And, while the doctor’s knowledge and expertise were evident, I could see the bewilderment growing in the Boss’ eyes with every new medical term. I struggled to keep up as I made notes for later reference. Because, I find some weird comfort in the researching and understanding the heretofore unknown terms. And, since I know someone will ask...we're dealing with a suspected hepatocellular carcinoma. We won't know for certain until pathology comes back sometime after surgery. We left the appointment feeling more than a little overwhelmed. No matter how much we tried to wish it away…we were indeed face to face with “the big scary”. The specialist and his team were going to consult on the films and would probably schedule a biopsy for the following week. They would call in a couple of days. But, when the phone call came, it wasn’t to schedule a biopsy. No, there was an opening in the surgery schedule...they wanted to do a pre-admission consult. ...and just like that we were off to the races. Can I just say that I have learned more about the human hepatic system in one week than I thought possible? We’ve had a crash course in function, disease and treatment. And, our learning experience isn’t over...not by a long shot. Back to the story. The pre-admission consult took a couple of hours. The team patiently, graciously walked us through the problem, they talked us through the surgery, told us about risks and recovery and set up a whole battery of blood work and scans. Office hours were ending before all the paperwork could be completed, so we headed home to do chores after the prescribed scans. We went back the next morning for the pre-admission bloodwork and more paperwork. All in all, we ended up making THREE trips to the hospital in one short week. This in itself is no small feat for the “country mice” who definitely feel out of their element in the “big city”. (yes, I know that Charlottesville is NOT at all big…but we are truly hicks from the sticks) The trip to the hospital takes about an hour. Then it can take ages to find a parking spot (and getting back out of the parking garage always sends the Boss’ blood pressure soaring). The trip back over the mountain can be frustrating as there are lots of big trucks that can’t seem to keep up speed. 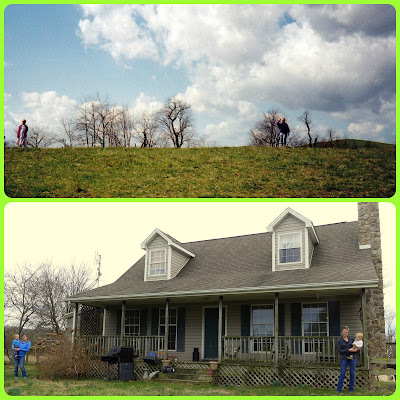 I do not exaggerate when I say a time of recovery is required upon return to our little home here on the hill. So quite honestly, there just hasn’t been time for farm work this week, what with all those trips over the mountain. And, I am quite thankful that winter storm Stella (that was supposed to be the BIG snow of the season) was next to nothing. Otherwise, the travelling could have been even more trying. With all the running, we didn’t get the tiny transplants in the hoophouse. But, I guess that was actually good thing since it was brutally cold and windy (with wind gusts to 45 mph, it felt like it was more than 20 below zero). Considering that the Boss is going to be laid up for a while, I guess I should be glad that the majority of the early brassica crop succumbed to some sort of soil-borne disease. (I did find time to re-seed...we will have a crop, it will just be late) And, even though it was rather sad that “Lazarus” succumbed, despite a valiant effort all around...at least I don’t have any bottle babies to worry about right now. (it seems he contracted tetanus in the very early days of his life---I’ll tell you that story another time) I know “all things work together for good”...I have been heard to mutter that “it is what it is”...and more than one person has told me “if HE leads you to it, HE will lead you through it”...and while all those sound just the least bit hokey, those little sayings are what’s keeping us going right now, reminding us to hold onto our faith. The surgery is next week. Next week. Like just a couple of days from now. Everything just miraculously “fell into place” which rarely happens. It’s great that he doesn’t have to wait and worry. It’s great that they will get it out and get him on the road to recovery. But...next week? We thank you all for your prayers, concerns and offers to help. Your kindness is a balm to our worried minds and a comfort to our troubled hearts. Because, honestly, right now I can think of little else. Thanks for stopping by. Please come visit” again real soon. In like a lion, out like a lamb...or was it in like a lamb...? March is often described as capricious, with its wild shifts in weather. It’s not unusual to see all the seasons in a week. Sometimes they are experienced in a single day. And, this week has been no exception. We’ve had extremely warm temperatures, wild winds, rain (and I think I hear the roll of thunder)…then the weather turned bitterly cold…and now, now we’re watching a storm form off the coast that originally had forecasters calling for “the big one”. Although, they have down-graded the predictions dramatically with the caveat that the pattern could shift and the forecast change again. Yes, March is here with all its wild weather moods, the very definition of capricious. Actually, capricious just seemed to describe the entire week causing great swings from anxiety to optimism and back again. I’m certain that someone somewhere would say that these are tests of our faith, designed to make us stronger. To which I’m going to say...i’m perfectly fine with being weak. I’d really like a short time “beside the still waters”...but that doesn’t seem to be the plan. So...on we go. While the weird weather is just a minor inconvenience to many people, farmers everywhere get worried knowing that future crops and livestock will be affected. The warm weather has caused many fruit trees to blossom far earlier than normal. While this looks pretty and seems a real “sign of early spring” it may well prove disastrous. Those lovely blossoms are the only shot at fruit for the season and with the frigid temperatures predicted for this week, many of them will freeze and die. Although orchardists everywhere are learning to employ new types of technology to protect the delicate flowers, there certainly will be losses. And, the losses could be catastrophic for some. Personally, tree fruits don’t account for a great deal of our income and the orchard is generally quite low on our priority list. When we planted our trees, we didn’t give a great deal of consideration to the fact that the altitude (right at 2000 feet) on our wind-swept hill would put us at risk for late-season frost nearly every year. We have come to see any sort of fruit as a special blessing generally just for our personal enjoyment. Because of our altitude and the truly capricious nature of March’s weather, we learned long ago not to try to plant anything out early in the season...no matter how beautifully Spring-like the weather may seem. So, hoophouse crops have always been our area for success. This year, rats invaded the hoophouses, eating the crops, and gnawing through the irrigation lines. But, rats? After all these years, WHY rats? The damage was devastating. With the beginning of the Market just weeks away, the situation was getting desperate. The Boss has spent hours (weeks, months) researching and building traps to no real avail. After a great deal of debate and discussion, he put out poison. (don’t worry, the other animals cannot get to it) However, it hasn’t even been touched. So far, he has gotten the best results with the old-fashioned wooden traps. (the cheapest, most “low-tech” option available) He has caught a great number of enormous, well-fed rats. But, the question remained...why now? If we couldn’t come up with a solution or a reason, it was beginning to look like hoophouse growing was in real danger. And, I don’t guess I have to tell you that the hoophouse crops represent a good portion of our income. He cleared and cleaned, plugged holes and researched more traps. Then, it occurred to him. They must be attracted to the corn gluten. Corn gluten is a by-product of processed corn. Before anyone says anything…it’s not the same GLUTEN that is such a dietary concern these days. (another time, another post) It is used both as an animal feed and as a “natural herbicide”. It has been used by the organic/sustainable community for years to prevent/inhibit weed growth. As it breaks down, it adds nitrogen to the soil. Sounds like a winning proposition, right? But, it is corn. And corn smells delicious and tastes good, too. (no, I haven’t put it on the menu) We have been using it extensively in the hoophouses. That would explain why the rats were tunneling in and digging through the beds. So, stop using the corn gluten and stop having rats…theoretically. So far, so good. We have seen no new rat activity and we have done a little planting in anticipation of the Market season. The fact of the matter is, the corn gluten really doesn’t work that well to control the weeds. The best, most effective “herbicide” (way to kill weeds) is the business end of a hoe. Or pulling them out by hand. But, now the weather has put us in a holding pattern for the hoophouses. It is supposed to be 17* one night soon. There’s no point in planting any tender transplants just to watch them freeze. Looks like we’re just going to get a late start this year. 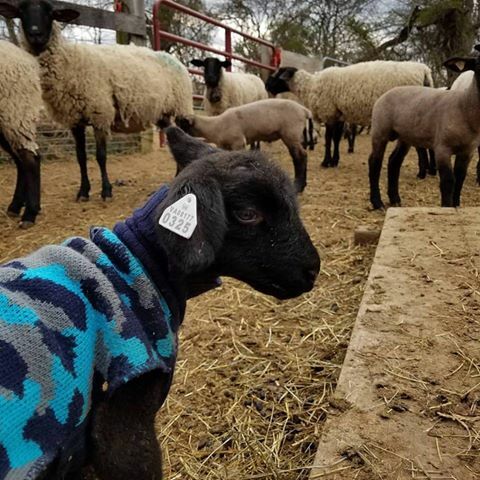 In barn news, “Lazarus” made our Instagram shot of the week when he joined the flock. (look for homesteadhillfarm on Instagram) Considering his rocky start in life…this was a big step. However, by the following morning, he was hopping around on three legs. And, he was wheezing and coughing. Oh no! Apparently, he had either gotten stepped on or butted in the night. (I totally understand either one of those, he’s always getting in the way and he is a nuisance) As for the cough, I would blame the changeable weather once again. So, he went back in his nursery pen. With rest and protection, he was back on all four hooves in short order. He was given a course of penicillin for his respiratory ailments. Since his lungs sound clear, and his appetite is totally unaffected, I’m fairly certain he will be fine. Then, (because of the weather) we ran the whole flock through for a round of de-worming. The mild weather has us concerned about the issue of internal parasites this year. The oocysts (eggs) of the parasites are found in the soil. As the weather warms, these eggs hatch and the larva make their homes in the tender, young grass. As the livestock nibble the leaves near the soil, they inadvertently ingest them. In the warm, dark environment of the animals’ gut, the parasites multiply exponentially and cause all sorts of health issues. These health issues can turn deadly all too quickly. Keeping the animals robust and healthy is our number one priority. 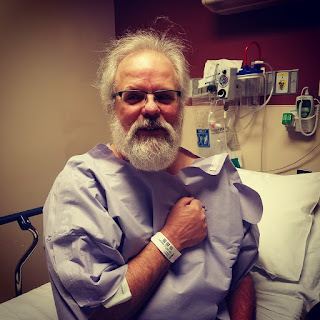 Speaking of health…The Boss has been struggling with some “symptoms” for months now and he’s been through test after test looking for some definitive results. This week was another test. As he settled in to wait for the results, the doctor’s office called. They could see him right away. That in itself is a good news-bad news proposition. An appointment right away-good news. The need for said appointment-bad. It appears there is a possibility/probability that the small mass in his liver is cancerous. I must admit, this news sent anxiety levels soaring. But, they wanted to do another test. Seriously? Thankfully, the doctor understood the Boss’ need for a timely solution (the Boss actually said "get it out...and get it out now!") and said he would make a referral to a specialist and ask him to expedite things. 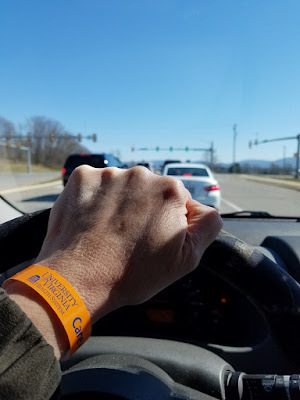 So, tomorrow at o-dark-thirty we will set off to the University Medical Center on the other side of the mountain to take action on the next step of this procedure. If you’re a praying person, or just a thinker of good thoughts, I....no, WE...would truly appreciate if you would do so on our behalf. While the prognosis sounds good, the whole situation is more than a little overwhelming and something we never thought we would ever have to consider facing. Now that I’ve shared that piece of news, I’m stuck as for a way to end this post on a positive note. Thanks for stopping by. Thanks for reading! I hope you’ll come “visit” us again real soon. March came in like a lion, bringing high winds and “meteorological Spring” (March 1 is Spring according to weather folk)…and ironically some of the coldest temperatures we’ve experienced in a while, along with snow flurries. Go figure. While the change in weather brought some much-needed moisture, of course that was followed by WIND. We were spared any catastrophic effects (there were reports of tornadoes, downed trees and power outages around the state) except for one of the big trees out front. In past years, we’ve had the hoophouses full of greens by this point. It’s looking pretty barren down there right now and it's going to be pretty slim pickin’s for Opening Day of the Market on April 1st. We have to get the hoophouse issue solved, not just because our livelihood depends on vegetable sales, but it’s also time to start more seeds and I’m running out of room in the greenhouses. But, we couldn’t take the chance with the cold snap damaging the tiny transplants, so they stayed put for a bit longer. Despite 20* as an overnight low, the little seedlings stayed warm and toasty in the greenhouse under cover. It looks like the weather has moderated, so guess what’s on the agenda for the upcoming week…? I had seen some indications of early labor at chore time, so I went back around 2 am for another check. I saw some little feet and figured everything was “copasetic” ...and things would move quickly from that point. Lambing season has been somewhat “challenging” this year. I do not exaggerate when I say nothing has gone quite like I thought it would. Nothing. …and this night was going to prove to be the rule rather than the exception. When I tell the tragic stories, I hope you don’t think that’s what happens every single time. Don’t get the idea that we have nothing but problems, because the successes far out-number the losses. I don’t tell these stories so you’ll think we’re stupid or in need of further information. Nor, do I share as a way to “humble-brag” when we’ve overcome serious difficulties. And, I most definitely do not tell you so you’ll feel sorry for us or get the impression that this life is just too hard and miserable. Often those pretty pictures on social media are reached only after we’ve either slogged through the slough of despond or traversed the valley of the shadow or trekked hill difficulty. Occasionally it has been a combination or something far more sinister, The getting there is sometimes the most important part of the story. That’s my real reason for sharing. By recording the hard times, we come to a greater appreciation of the blessings. And, that encourages a spirit of gratefulness. After a quick trip to the house for fresh batteries for my rapidly dimming headlamp, I settled in to wait and watch. There was an old ewe who kept bothering the mother-to-be. For some reason, this particular sheep has become hyper-focused on newborns. So much so that we had to lock her in a stall alone so she would leave the last lamb alone and allow the mother to care for it. She was acting up again, so in my head I started composing a blog post about this “dingbat doula sheep” as I waited. My reverie was cut short when her actions became so disruptive to the other ewe that I had to bop the ovine nursemaid in the nose with the flashlight and run her out of the barn. I finally gave the whole bunch some hay in hopes of reducing the chaos. Thankfully, things calmed down after that. Mother-to-be was struggling. Something wasn’t right, but there was no way to check her without some sort of assistance (and doula-sheep was clearly not a good candidate). So, it was off to the house to wake the Boss. I truly hated to do this, but…no one promised shepherding would be restful. When we got back, she was on her side, stretched prostate and motionless. Not a good sign at all. The Boss got her back on her feet and held her steady so I could investigate the situation. What I found certainly didn’t bode well…for any of us. Since it was mis-presented, it was up to me to re-position it. As I attempted to manipulate it, I realized it was very long and one of its front feet was tucked up underneath it. I got the foot straightened out, but, I couldn’t do anything about the size and the other front foot kept hanging up on mama sheep’s pelvic bone. I jiggled it, massaged it…tried everything I could…I even tried pushing the entire lamb back in and starting over. (I have had success with all of these maneuvers in the past) I worked for at least an hour. Mama sheep collapsed on the floor, bleeding profusely. 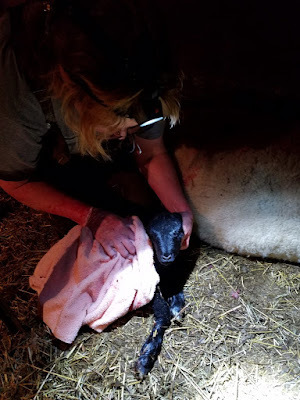 Now I was stuck with my arm inside the sheep, lying on my back, staring at the cobwebs on the barn ceiling by the light of my headlamp and one thought became perfectly clear. It wasn’t coming out. Nope. No way. It was time to make a judgement call…the decision that I hate to make. It was obvious that the sheep was going to die. There was not even a remote chance of recovery. More than likely the lamb was already dead. But, mama-sheep was obviously suffering and in pain, we couldn’t let it go on any longer. She would have to be put down. 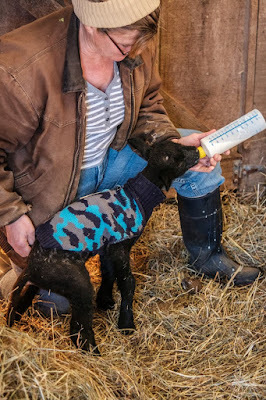 As I came to this realization, I could feel a small, steady heartbeat under my hand that was still deep inside the ewe. The lamb was alive! I shared this information with the Boss. We looked at each other. Even though mama-sheep would die (and it was just a matter of WHEN, not IF) we would have to try to save the lamb. After the Boss put her down, I cut into her, performing a hasty (rather haphazard) post-mortem C-section, and pulled the lamb out. He was not particularly huge (about 10 pounds) but he was quite long (about 21 inches from head to tail) …and he showed almost no will to live. (considering the trauma he had been through for the past two hours, this was no real surprise) We rubbed him off, gave him a dose of colostrum gel and a shot of Bo-se (this is a mineral supplement that we give all lambs shortly after birth). But, he had absolutely no strength. A newborn lamb should be trying to stand and nurse within moments of birth and he was just lying there, moaning slightly. When I tried to rouse him, he stayed limp and nearly motionless. Since he had so little sucking reflex, I didn’t even try to give him any milk. We had put an enormous amount of effort into that failed birth experience. (I was about to discover muscles I didn’t even know I had!) And, it was going to be a total loss. Two hours from my initial trip to the barn, I was washing the blood, birth goo and sheep poop out of my hair. (the shower even needed cleaning afterwards) We both fell into exhausted sleep and all too soon it was morning again. I slipped down to the barn, hoping to see some sign of life. But, no. Nothing. Choretime meant bottles for the bigger lambs, so I was getting them situated at the lamb bar when I thought I heard/saw something. Across the barn, from under the blanket in the jug pen, came a little sound. The blanket moved slightly and a little lamb face peeked out. BAA! “Lazarus” had returned from the dead. I couldn’t believe it. The Boss couldn’t believe it. It didn’t seem possible. He couldn’t stand properly. I couldn’t tell if I had somehow injured his rear legs irreparably in the traumatic delivery sequence. He had to have his head held to even attempt to drink the bottle. But, he was indeed alive. And, he was HUNGRY! Now, he’s trying to run. He knows that his food is coming when he hears my voice and he bunts the bottle and latches on with no assistance and drains every drop. He’s gained weight and is up over 13 pounds and will probably join the flock once the weather warms up. The rest of the week passed in a haze of exhaustion, sore muscles and lamb bottle preparation. I know we did some other farm stuff (I did get the farm taxes completed AND filed…YAY) but, I’m hard-pressed to remember what else. We vaccinated lambs again and made a trip to town for rat-proofing materials…and the Boss got the trailer vent repaired and put new mats in his truck. This meant more than one trip to Mountain Valley Truck and Trailer Thanks, K & V! Here’s hoping the upcoming week is just a little less dramatic…make that a LOT less dramatic! Thanks for stopping by. Come back and “visit” again real soon.